UB12120 : 12-volt 12 Amp-hour sealed-lead rechargeable battery. Fits MANY wheelchairs & mobility carts. 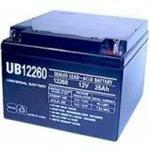 # UB12120: 12 volt 12Ah Sealed Lead Battery. Universal Battery brand. Dimensions: 5 15/16" long x 3 11/16" tall x 3 7/8" thick. Weight: 8.62 lbs. When ordering online, $5 handling charge is added per battery for extra freight charges. UB12180: 12 volt 18Ah Sealed Lead battery. Universal Battery brand. Dimensions: 7 1/16" long x 6 9/16" tall x 3" thick. Weight: 12.5 lbs. 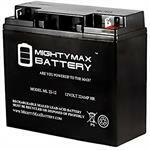 ML22-12 : 12 volt 22Ah rechargeable Sealed Lead battery for Scooters, Mobility Carts, Portable Lights, PowerStations, etc. Some units require 2 batteries; some require 1. Fits a wide range of models (see x-ref list). UB12260 : 12-volt 26 Amp-hour sealed-lead rechargeable battery. 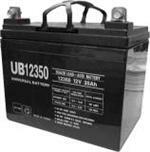 UB12260: 12 volt 26Ah Sealed Lead battery. Universal Battery brand. Dimensions: 6 17/32" across x 5" tall x 6 7/8" deep. Weight: 20 lbs. For UPS, wheelchairs, mobility scooters, etc. For shipping costs, please note that $15 is added per unit. UB12350 : 12-volt 35 Amp-hour sealed-lead rechargeable battery.